New bike launched by TVS – TVS Apache RTR FI 160 is full of mind blowing features. The bike is an excellent combination of powerful performance, advanced safety features and eye catching looks. 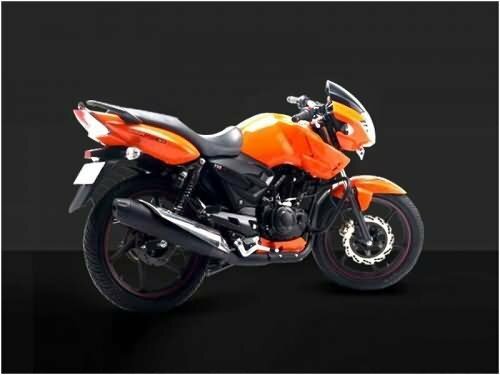 TVS Apache RTR FI 160 is available in three scintillating colors – Black, Matte Grey and Orange. The broad headlamp, bulbous fuel tank, shrouds on both sides of the tank – all give a sturdy look to the bike. The stylish stickers on the shrouds and panels impart a sporty appearance. The LED lamps at the rear are very stylish. TVS Apache RTR FI 160 has given high importance to comfort features for the rider. The self start bike has Digital Fuel Gauge, Analogue Tachometer, Digital – 1 Trip Meter and Passenger Footrest. Other comfort features include Step-up Seat, Pass Light, Low Fuel Indicator, Low Oil Indicator and Low Battery Indicator. The bike manufacturers have laid special stress on safety features in TVS Apache RTR FI 160. The telescopic Forks (front) suspension and Monotube Inverted Gas filled Shocks (rear) suspension provide the much required comfort as well as safety. The 270 mm (front) disc brakes and 200 mm (rear) disc brakes provide more control and safety to the rider. The engine of TVS Apache RTR FI 160 is very powerful. The bike has 159.7 cc, 4 stroke, Fi, air cooled engine which produces a maximum power of 15.7 bhp at 8500 rpm and a maximum torque of 13.1 Nm at 6500 rpm. The fuel injection technology enhances the performance of the bike. The price of TVS Apache RTR FI 160 is Rs. 70,000 (taking Mumbai as base price location). However, the price specified is indicative price only and reflects lowest approximate price which excludes tax, registration, insurance and cost of accessories.